Do you remember the mid to late 90’s when nu metal became the dominant sound of the airwaves? The music scene was struggling to find the next big thing in the wake of grunge, and the angst of nu metal became the next big thing. 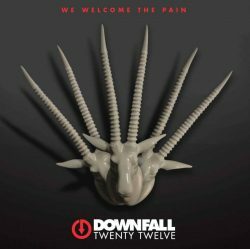 The debut album by Downfall 2012 would fit right into that sound – a nice mix of angst, aggression, and slower moments. Downfall 2012 have made an impression on the national scene, having shared the stage with Alice Cooper, Twisted Sister, and many others. The band hails from Houston, TX and has won multiple “Texas Buzz” awards. We Welcome The Pain is the band’s 2017 offering, a compilation of reworked older tunes alongside new songs. So how does the finished product hold up? We Welcome The Pain is an album that bears traces of a 90’s influence (think Nine Inch Nails or White Zombie) but has a forward-thinking approach. There are songs that are very immediate as well as songs that take a few listens to show their beauty. An “alternative” hit for the year 2017. Take Control begins with squealing guitars before a thrash metal sound takes over. It all leads up to the stunning chorus with its shout-along chant of the title. The music fades away in a rush of white noise and melodic hooks. The segues into Find Your Enemy, a companion piece t to the opener. Thrash guitars and emotive vocals, what’s not to love? The title track locks into a groove right from the outset, an industrial / metal feel to this song recalling the greatest bits of Korn. The song vacillates between a full-on assault and melody, allowing the listener to focus on the vocals. Save The Queen pulls off a neat trick – changing from a full-on assault to a melodic alternative anthem halfway through. Forward Movement is the soundtrack to an imaginary film, an epic feel permeating the atmosphere. It is brief but impactful. It serves as the intro to Make Us One, a masterful track coming near the end of the album. Singing more than spitting out words, this is probably my favorite song on the record. Grunge mixed with Screamo (remember that genre? Still a silly name ha ha ha). It locks into a metallic groove, this is the perfect car jam song. Go ahead and follow the band’s adventures via their Facebook page. The album will be available from the band and all digital retailers very soon. I really love this record, and I think if you are inclined towards thoughtful and aggressive music you just may love it too.